Highland Park is one of the oldest distilleries in Scotland, having been established in 1798. It is also the most northern distillery currently operating, being located near Kirkwall on the Orkney islands. The core range of Highland Park is extensive covering a wide age range and it is one of the best selling whiskies worldwide. They produce peated malt barley with quite a high phenol level (40ppm) and this is then mixed with malted barley from their sister distillery (Tamdhu in Speyside), which has no peat influence at all. This creates a spirit which is smoky but not to the degree of the majority of Islay whiskies. It is therefore more approachable and is a good distillery to try if you don't like too much smoky flavour or any at all. This particular release is a 21 years old from the small Mackillop's Choice independent bottling company. 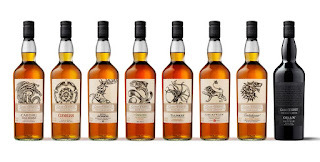 Other independent bottlings are readily available. The first thing I noticed was that there is no smoke on the nose or palate! This surprised me even though it is a fairly old whisky (as smoky whiskies age, the smokiness tends to mellow but should still be a feature). Instead, there is lots of sweet vanilla, some woodiness and stacks of fresh fruit (think of crisp green apples, pears and honeydew melon). This intensity is replicated on the palate and is joined by some notes of honey, something woody but spicy (like cinnamon bark) and a hint of aniseed right at the end. It is full bodied, very good and enjoyable with a reasonably long vanilla based finish. My only disappointment was that the smokiness normally associated with Highland Park wasn't there. Bottles of this are rare and will cost you around £55 from independent retailers only. 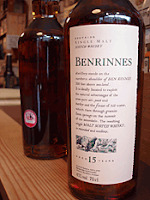 Benrinnes is a Speyside distillery owned by drinks giant Diageo. Originally opening in 1826, the old Victorian buildings were completely demolished and rebuilt in the late 1950s. The majority of the whisky produced at Benrinnes (around 2.5 million litres) is used in the blending of Johnnie Walker red label and black label, which both sell massive amounts each year around the world. The only official bottling from the distillery is this 15 years old, which forms part of Diageo's 'Flora and Fauna' range (this range showcases whiskies from lesser known distilleries in their portfolio). Other independent bottlings are rare. This is dark, golden brown in colour and the nose is full of maltiness from the barley, dried fruit (raisins and sultanas) and lots of sherry, indicating that it has spent significant time in sherry casks. On the palate, these notes are all as prominent and are joined by something creamy and nutty (walnuts or brazil nuts, I think). There is an element of bitterness as well which reminded me of caramel or burnt sugar and dark chocolate. The finish was short, flat and disappointing with not much going on. This is good and quite complex but may have too much sherry cask influence for some people. It retails around £35 a bottle. 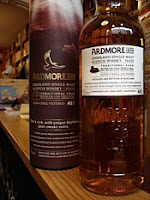 Ardmore is a Highland distillery near Aberdeen and is unusual as they use peated malt for their core range of whisky. Other highland and Speyside distilleries do this, but only for limited releases or batches to supplement their regular range (most notably Benriach, Benromach and Tomintoul). The phenol level is around 14ppm, making the final spirit much less smoky than whiskies from Islay or some of the other islands. The distillery is owned by Jim Beam Global and most of the 5 million litres of whisky produced each year goes to their flagship blend, Teacher's Highland Cream (one of the biggest selling blended whiskies in the UK). This 'Traditional Cask' was originally for export and duty free only but has just been released to UK retailers with the name deriving from the fact that the whisky is matured for some part in small casks that are a quarter of the size of a regular cask. . Other bottlings are few and far between, mostly coming from independent companies. On the nose, this smells pretty good with the smokiness being quite meaty (like smoke from a barbeque) and sweet (it reminded me of fresh fruit, pears especially). On the palate, there is a similar initial sweetness and maltiness however this is quickly engulfed by the smoke. This feels thin in the mouth and the finish is short, both of which are quite different for a smoky whisky. Overall I was a bit disappointed as it was pretty one dimensional. It was all smoke and not much else. At £25-£30, it is up against some of the smoky big boys (Ardbeg 10 years old, Laphroaig 10 and Bowmore 12) but would be a decent choice if you were looking for something a bit more unusual. Distil 2008 is a trade only show that is held annually at the Excel exhibition centre in London. It is run in conjunction with the London International Wine Fair (LIWF), with the idea to showcase new and unusual products to retailers, restaurants etc. Myself and Matt (one of my colleagues from Royal Mile Whiskies) went to the show and sampled some of the products on offer. 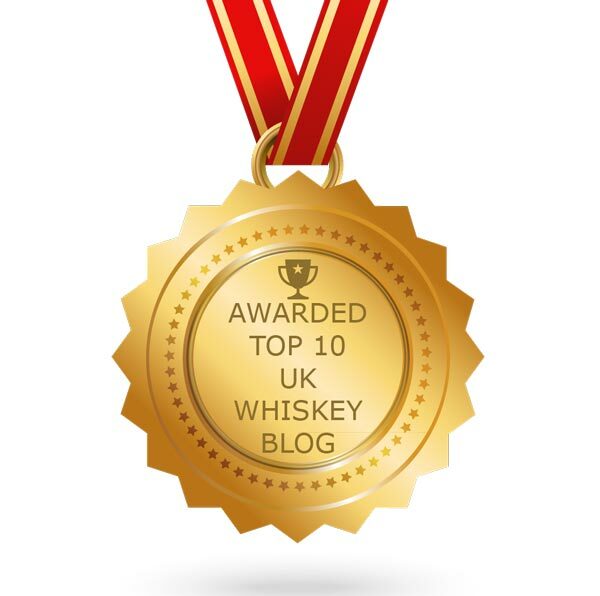 We tried a number of whiskies, which I have listed below with some basic tasting notes and thoughts. As and when I taste them again, then I will expand these notes and give more detail and distillery information. We began on a supplier stand who had a large range of award winning American whiskies (commonly called bourbons) and worked from there! This bourbon is rich and complex with some sweet caramel, vanilla and coconut flavours present. Age has done this a lot of favours and it is so smooth. It would be very easy to drink loads of this. It is thick, creamy and full bodied with a nice finish that has just a hint of aniseed. This one is an 8 years old bourbon that is really good as well. The nose has sweet grain on it, mixed with a nutty element (walnuts, I think), vanilla oakiness and almost a hint of something smoky. This is rich on the palate with lots of woodiness (this always reminds me of coconut), vanilla and caramel. That hint of smoke is there on the finish also. very interesting. Another bourbon that has been aged for 12 years in fresh oak and the vanilla and coconut flavours are very prominent here. This is very well balanced and feels smooth and luxurious on the palate. It is a limited release due to being from a single barrel. A great example of a bourbon. Bottled at cask strength, this was full in flavour and body. The marriage of the sweetness from grains used and the influence of the wood was perfect. Lots of vanilla and coconut but also an interesting hint of nuts (something like walnuts and almonds). On adding water, it becomes almost too perfect and creamy. I need to hunt down a bottle of this one because it is fantastic. Having not tasted many Japanese whiskies, I was interested to try this one. Japan is only second to Scotland in the amount of whisky produced and generally the standard is high. The nose has a hint of peat smoke and earth to it with some interesting sweetness. On the palate, it is quite fruity (dried fruit though) and citrusy (think of orange marmalade). It feels creamy and smooth with quite a dry finish where the peat smoke takes over. Really nice. This had moved the 16 years old on to another level. Part maturation in sherry casks make this certainly more complex. It is richer and creamier in the mouth and with a nice level of sweetness, vanilla and something nutty (maybe almonds?). This is mixed with just a whiff of smokiness. It also had an interesting salty tang to it which complimented the rich caramel and sherry notes. On the finish there is also a hint of aniseed. Very good indeed! We moved on to the Cooley distillery stand where we tried this and the following two whiskies. This has been finished in Madiera casks and this gives the whiskey some great dried fruit notes (think of raisins, apricots, pears). It is rich, creamy and sweet with some lovely caramel and vanilla as well. A really, really good whiskey and a great example of how a cask finish can influence the final product. This is a newly released and very limited batch single grain whiskey. These contain no barley and are rare. It is smooth and sweet with lots of vanilla, honey and almonds. Very full bodied and it just melts in your mouth. I had never properly tried grain whiskey before and this is an excellent example of one. Another very limited release of only 1000 bottles. This is the best Irish whiskey that I have tasted to date. It is rich, creamy and smooth with lots of vanilla, honey and sweet maltiness mixed with an interesting dryness and some spiciness (like nutmeg, I think and maybe just a hint of ginger). Very well balanced and truly great. Tormore is a little known distillery in Speyside. It was only opened in 1958 and the majority of the whisky produced is put into Teacher's and Ballantine's, which are two of the biggest selling blended whiskies in the UK. The only current official distillery bottling is this 12 years old and other independent bottlings are hard to find. 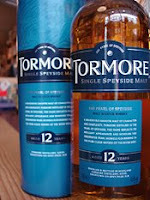 As a result, Tormore has a bit of a cult following (this includes Michael, my boss at Royal Mile Whiskies!). This was an impulse purchase by Karen, as Morrison's were selling it for £15 (the normal price is between £20-22) and it seemed a bargain. The appearance is golden brown (like caramel) and the nose is quite pleasant. There is something resembling fresh apples and also some freshly cut grass, vanilla and a whiff of heather. On the palate, the malted barley sweetness is the most prominent feature and this takes over virtually everything else. There is something herbal (maybe the grass again) and an acidic note (think of orange or lemon zest) that is present but overall, it is quite one dimensional. It feels thin in the mouth and the raw spirit coming through would not be to everyone's taste. The finish is quite short but I found it pleasant as the raw spirit from the palate fades and reveals a decent creamy mix of vanilla, toffee and coconut. Right at the end, there is a woodiness that appears, giving a slightly bitter final taste. This whisky is basic but good, although as mentioned before, not to everyone's taste. It is pleasant and easy drinking and would be good as an everyday drinking whisky. I am certainly not complaining about having a bottle of this in our whisky cupboard, especially at the bargain price of £15. Balvenie is one of the largest and most famous distilleries in Scotland producing over 5.5 million litres of whisky per year. It is located in Dufftown in Speyside and is owned by William Grant & Sons, who also own Glenfiddich. Balvenie is unique as they have their own floor maltings (used for the germination of the barley), a cooperage where they make their casks and even grow some of the barley used during production in the grounds of the distillery. Last year, over 1.5 million bottles of Balvenie were sold across the world putting it inside the top 10 for sales. This 12 years old 'Doublewood' is one of the cornerstones of that success. The term 'Doublewood' refers to the fact that the whisky is stored in two types of wooden cask during it's 12 years of maturation. For approximately 10 years, it matures in bourbon casks and is then transferred into sherry casks for the final two years. The colour is gorgeous and golden. The nose is full of sweet, ripe stone fruits (think of apricots and peaches) combined with vanilla, coconut and honey. On the palate, this is so smooth, mellow and creamy that your taste buds go into ecstasy. It feels thick in the mouth. There is a glorious fruity and malty sweetness (again the ripe stone fruits but joined by raisins and sultanas), an element of nuts (almonds, i think) and a hint of something spicy (like nutmeg or cinnamon). The finish is excellent and quite long with lots of creamy concentrated fruit (raisins again) and vanilla, with the sherry influence giving a tiny bit of refreshing dryness. Balvenie have produced one hell of a whisky here. It is one of my favourites to date and offers a gorgeous and complex drinking experience. Many people say that the 'Doublewood' shows the perfect marriage and time of maturation between the bourbon and sherry casks and I would have to agree. 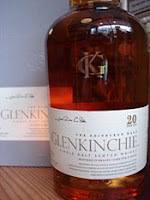 This is a fantastic whisky and is widely available for between £25-30. Go out and buy a bottle! Knockando distillery lies in central Speyside, between the villages of Archiestown and Knockando. It is owned by drinks giant Diageo and is one of the best selling single malts in the world (the main markets are France, Spain and Italy). 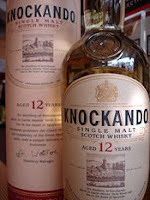 Despite this, Knockando is relatively unknown in the UK market. Much of the whisky produced at the distillery (approx. 92%) is used in the blending of J&B Rare, which is one of the biggest selling blends across the globe. The only regular bottling is this 12 years old with limited edition distillery and independent bottlings occasionally getting released. The colour is light like a pale lemon. The nose is pleasant but with a heavy element of malted barley. There is a sweetness present along with a citrus note (lemon zest, I think) and nuts (like a mixture of almonds, walnuts and coconuts). 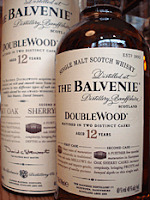 This whisky is very smooth on the palate and feels soft and creamy in the mouth. It is sweet and very fruity (think of raisins) with those malty and citrus notes from the nose coming through, although the citrus notes are more concentrated here (like dried orange or lemon candied peel). The finish is quite long, dry and creamy. Almonds are there again (more concerntrated than on the nose though, like almond essence or marzipan) along with some vanilla and toffee. This is a decent whisky, if not the most complex, and would be great as a pre-dinner drink or on a hot day. It is available in supermarkets and independent retailers alike and should cost around £25. Amrut is a distillery in India. It is located in Bangalore in the south west of the country and was originally established in 1948, although whisky production didn't begin until the mid 1980s. The Indian market is one of the biggest and fastest growing in the world for consumption of whisky. However, most 'whisky' is made from various local ingredients (crucially not barley or other grains) and can therefore not be technically classed as whisky. Also the standard can be very poor. At Amrut they do use malted barley, which is grown and malted in other parts of India. They use water from a well that is located 15 miles from the distillery and then distillation and maturation takes place in Bangalore. 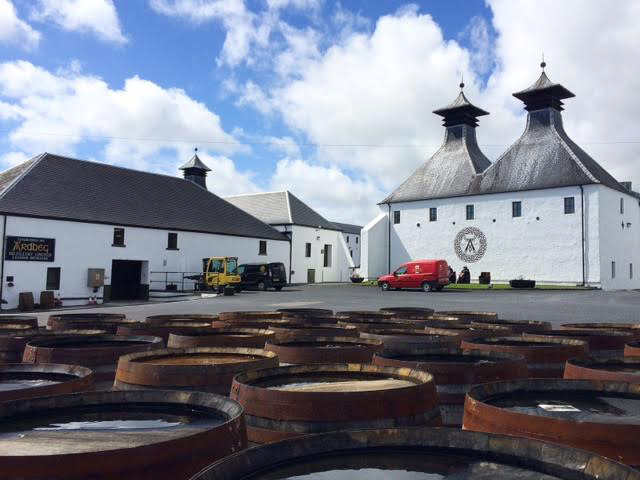 Here, the temperature and humidity are high so the whisky matures much faster than in Scotland or Ireland. As a result of this the spirit evaporates much quicker (this evaporation is called the 'angel's share') and maturation for anything above four years is difficult. Amrut are the first Indian distillery to seriously export to the UK and Europe and this one is a peated version (the peat is actually flown over from Scotland as they don't have any in India!). It is bottled at cask strength with a very high alcohol level of 61.9% ABV. The nose initially blasts you with peat smoke but underneath is sweet and rich with lots of dried fruit, nuts and marzipan (imagine a Christmas fruit cake). There is also something that is not natural in there that reminded me of custard powder or fake vanilla essence. This is full bodied on the palate and just blows your mouth away (mine actually went numb!). The burn from the high alcohol level just obliterates everything else so I added some water. This revealed some quite sweet and dried fruit notes (think of raisins and dried apples and pears) but it was very dry and woody. I added some more water (almost twice as much water to whisky by this point) and it opened out well and revealed a lovely soft creamy sweetness that balanced much better with the peat smoke. It was still very dry though. This is a very interesting whisky if you get passed the initial aggressiveness in your mouth. It needs a lot of water but after adding this, it really is pretty good. 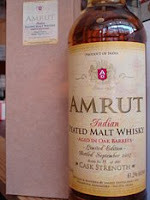 Amrut peated retails for £40 and is a limited release in the UK. 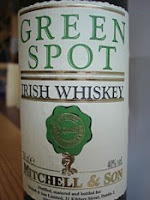 Green Spot is a premium Irish whiskey that is distilled by Midleton, the largest distillery in Ireland. It is one of the rarer whiskies in production with only around 5000 bottles released each year. Midleton is located in County Cork and is owned by Pernod Ricard, a large international drinks firm. 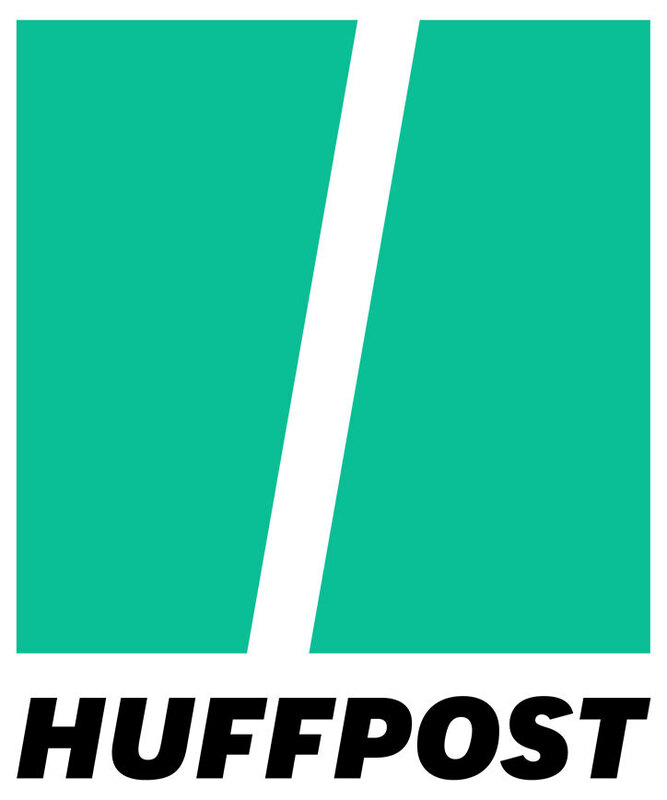 They also produce other famous brands such as Jameson, Tullamore Dew and Paddy there. They use a mixture of malted and regular barley (this is common in Irish whisky distillation, see explain about ... the difference between scottish and irish whiskies) and it is then triple distilled in a pure pot still. This still is large, squat and bowl shaped and is made of copper, lending the spirit it's unique Irish character. The whisky appears light in colour and no age is given on the label. It is actually a mixture of seven and eight years old pure pot still whiskies with some of it being matured in sherry casks. On the nose there is the malted barley coming forward but beneath this is some dried fruit sweetness (raisins and sultanas). This was a surprise on the palate. Normally Irish whiskies are light, fresh and smooth due to the triple distillation but this one is quite rich, full bodied and a bit rough. The maltiness and sweetness from the nose are present along with something strange and tangy (which I couldn't place) and a definate sherry influence. It burns a little so I added some water. This didn't really do it any favours and just diluted what was already there rather than revealing some new characteristics. The finish was dry and again rough with raw spirit plus an interesting note of menthol. I was disappointed by this. Numerous people rave about Green Spot but it didn't deliver the smoothness and freshness that I expected or wanted from an Irish whisky. This retails for around £35 a bottle. Glencadam can be found in the town of Brechin in the east Highlands. The distillery reopened in 2003 when it was bought by new owners, Angus Dundee Distillers. It had been closed by the previous owners in 2000, who kept everything intact so that production could restart immediately (this is called 'mothballing'). There is currently only one distillery bottling from Glencadam, which is a 15 years old, and most of the whisky produced goes into blends (primarily Ballantine's and Teacher's). However, there are a number of independent bottling releases. This one is a 16 years old and is limited to only 3840 bottles. It has been bottled for Milroy's, a famous whisky and wine shop in the centre of London, and I understand it will be available soon for around £50. The colour is light for something of this age (similar to the colour of hay). The nose is very vegetal with sweet, grassy and floral notes (like a spring meadow), although a whiff of raw spirit is also present. On the palate, there is an initial zing of citrus zest with vanilla and a sugary sweetness taking over. It is very light and quite refreshing. The finish is very disappointing, it is pretty much gone before it's got started with lots of raw spirit present. This is a shame because otherwise it is a decent, light and refreshing whisky. Bruichladdich (pronounced brook-laddie) is one of Scotland's most innovative distilleries. Based on the island of Islay, it is one of very few independently owned Scottish distilleries and since being taken over by a millionaire entrepreneur in 2000 has been very experimental with it's whisky production and release programme. Bruichladdich's distillery style is quite light and fresh with no smoky flavours or aromas, which contrasts to the majority of other whisky produced on Islay. 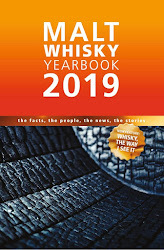 However, they do also release smoky whiskies under the Port Charlotte name and they are currently in the process of renovating the old Port Charlotte distillery on Islay, which closed during the late 1920s. They also have experimented by distilling their spirit three or four times and are well known for putting whisky into non traditional wine and dessert wine casks. The results are mixed but I like Bruichladdich's experimentation as they are trying to introduce new people to whisky, which can only be a good thing. However, many whisky purists do not like this approach, believing that whisky should be matured in the traditional casks of bourbon, sherry and refill whisky. Bruichladdich's range is extensive and they are always updating it with new releases. This one is from a couple of years ago and has been matured in one of those un-traditional wine casks (a full bodied red wine called Banyuls from the south of France). The first thing that I notice is the colour. It is very different for a whisky, having a pink tint reminiscent of rose wine. For this reason it was marketed to attract women to try and drink whisky. The nose has quite a lot of wine influence in it, with fresh red berries and grapes prominent. There is also a sweet tinge to the nose. On the palate, this whisky is very smooth and easy to drink with those rich red berries and grapes combating some tannic dryness that has come from the wooden wine casks. The finish is slightly short and starts off being smooth yet switches to be quite bitter (the tannins again, I guess) and some raw spirit coming through (indicating the whisky is young). Overall, this was quite pleasant easy drinking whisky, although the wine cask did give it a weird edge. It is unlike any other whisky I have tasted to date. If you can still find a bottle anywhere, then it is worth buying as it should only be around £20-25. 'Should i add water or ice to my whisky?' is a question that we get asked many times and here we will try to explain how adding water or ice changes whisky in positive and negative ways. The rest is then up to you! Ultimately, what you add to your whisky is all down to personal taste and there are no right or wrong answers. 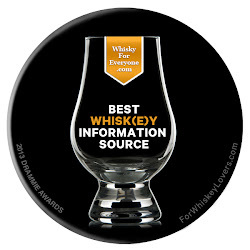 In reality, most whisky that has an alcohol level of between 40 and 45% already has some water added. This process is called 'cutting' and is done before bottling in order to bring the alcohol down to a more acceptable level for the majority of consumers. The water used is usually spring water that is found locally to the distillery. Many whisky connoisseurs believe that you should not add any water to whisky because then you are tasting it in the natural form with all of the original distillery characteristics and flavours. Again, I say it is personal choice. By adding water to a whisky, you can open up different, new and subtle flavours that you previously hadn't experienced. This is especially true when drinking cask strength whiskies that have higher alcohol levels (this can be up to and over 60% ABV in some cases). With cask strength whisky, the alcohol and resulting burning in your mouth can overpower even the most prominent flavours. By adding some water, this dilutes the alcohol and reduces it's effect, giving both the prominent and more subtle flavours a chance to shine. Imagine drinking orange squash concentrate without any water and then with water... it's essentially the same idea. How much water you add is entirely up to your taste. Ice is slightly different. Rather than enhancing flavours, it actually inhibits them as the ice makes the temperature of the whisky drop rapidly. It is the same as when you drink a good white wine that has been chilled down too much. It will be refreshing to drink but taste dull and flat - it will only start to open up and reveal its full character once it starts to warm up. Glen Scotia (pronounced glen sco-sha) is one of Scotland's smallest distilleries with a capacity of only 750,000 litres a year. It is one of only three remaining distilleries in the region of Campbeltown, the other two being Springbank and Glengyle (which only opened in 2004). Glen Scotia can be found on the main street of Campbeltown. The Campbeltown region once had many more distilleries and was a major force in whisky production. However, it was hit harder than the other regions during difficult times possibly due to the remoteness of it's location. Glen Scotia is little known and to a certain degree lives in the shadow of it's bigger and more famous neighbour, Springbank. They release only two regular bottlings, this 12 years old and a rarer 17 years old. The colour is quite dark and reminds me of caramel. The nose is quite smoky and peaty (like wet earth) with some interesting buttery sweetness and spicy, peppery notes coming through. This is also pretty smoky on the palate and that sweetness (a cross between butterscotch and honey) is also there. There are also dried fruit (raisins), something tart and fruity (like stewed cooking apples) and some raw spirit burning at the end. The finish is quite long, smoky and sweet with the raw spirit there plus something vegetal which had an element of gin about it (herbal botanicals and juniper). This is an interesting whisky that combines a decent amount of smokiness with sweetness. It would be a good introduction to smoky whisky for people that hadn't tried them before or thought that they wouldn't like the flavour. The only thing that spoilt it for me was the raw spirit that was present but overall I liked it. It is also very reasonably priced at just over £20, which is good for something that is 12 years old. Glenkinchie can be found just 15 miles from Edinburgh and is one of only three distilleries currently in operation in the Lowlands region. Maybe it is this close proximity to Edinburgh and the resulting tourist trade that has allowed the distillery to survive, while so many others in the Lowlands have perished. It is owned by multi national drinks giant Diageo and is one of their 'Classic Malts'. Large amounts of Glenkinchie whisky also go into the blending of the world famous Johnnie Walker brand. This particular whisky is a limited release (only 5000 bottles) and is bottled at cask strength (58.4% ABV). It has been matured for the first 10 years in a bourbon cask and then for the next 10 years in a cask that has previously held a German brandy called Asbach. The colour is deep gold and the intense nose is old, woody and slightly musty. The presence of the brandy is prominent with hints of fruit coming through (dried pears and apples). After five minutes or so, the nose opens up well to reveal more complexity of candied orange peel, caramel and something bitter like coffee beans. On the palate, it is full bodied, which is unusual for a Lowland whisky as they are normally very light and fresh. This one is creamy and sweet offering an obvious brandy influence mixed in with raisins, spices (cinnamon and nutmeg) and rich vanilla. There is a burn from the alcohol as the level is so high, so I would recommend adding water. Once I added a dash of water this becomes a very, very good whisky with the flavours and the level of alcohol becoming more balanced and it feels great in your mouth. The finish is reasonably long with just a hint of liquorice at the very end. This is a really good whisky that shows how a different cask, can influence and enhance the final product. The brandy influences are there but are not overpowering. The limited release, quality and age of this means that if you are lucky enough to get your hands on a bottle, then it will cost around £65.